Scrapbooking and Card-making Supplies: Design Team Classes! We are truly sorry for the delay in posting up the schedules for the upcoming and highly, highly anticipated Design Team Classes. Thank you for your patience!! Our designers - Emily, Sharon and Lia, have been working very hard for the past few weeks to create their own unique projects to share with our local scrappers. This is a great opportunity for you to not only meet them, but these ladies are full of wonderful ideas and techniques to share with you! These classes are well-worth signing up for to share, learn and ultimately HAVE FUN!!! "Once again, it is the holiday season. Are you thinking to decorate your cosy home? Come and join me in this class where you will use inexpensive, familiar things as an alternative for a picture frame and let this beauty brighten your wall!" "Create a collection of ten cards using stationery tags that you will beautify with an array of gorgeous papers, ribbons, laces and touches of fabrics. 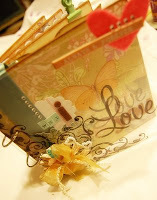 Learn how you can create beautiful notes of love with the simplest of products." "Count the ways you love that someone special with a gorgeous album that is chock-filled with unexpected embellishments and papers from Webster's Pages! Reminisce your love with touch of romantic ribbons, lace and pearls and swoon at the senses this album will invoke with shaped pages and off-the-pages details." To bring : Glue tape, Foam glue, Glue dots, Liquid glue (Glossy Accents), Distress Ink, 6-10 3R photos (larger photos can be cropped), Alpha stickers of your choice. "Come and get inky with me as you learn to alter a fabulous dressform from Creative Imaginations. Learn techniques with embossing, UTEE, crackle paint and mists like you've never done before and create cool looking embellishments from scratch using stamps and bling. Take home a cool vintage-looking dressform which is all the rage now!" Are you EXCITED as we are??!!!! If you sign up for ALL 4 CLASSES, you are entitled to a 10% discount AND a goody bag worth $20 of scrapping goodies AND Double Stamps!!!!! HURRY and sign up now to avoid disappointment!!!!! 3. If you are unable to attend the class, we will keep a class kit for you or alternatively, you may offer your seat to a friend. 4. No stamps will be awarded for class fees except for Class Package. are we allowed to use hongkong bank vouchers for the class payment? Unfortunately, we do not accept vouchers for class payment but cash only. Classes are starting soon! Sign up early to avoid disappointment!